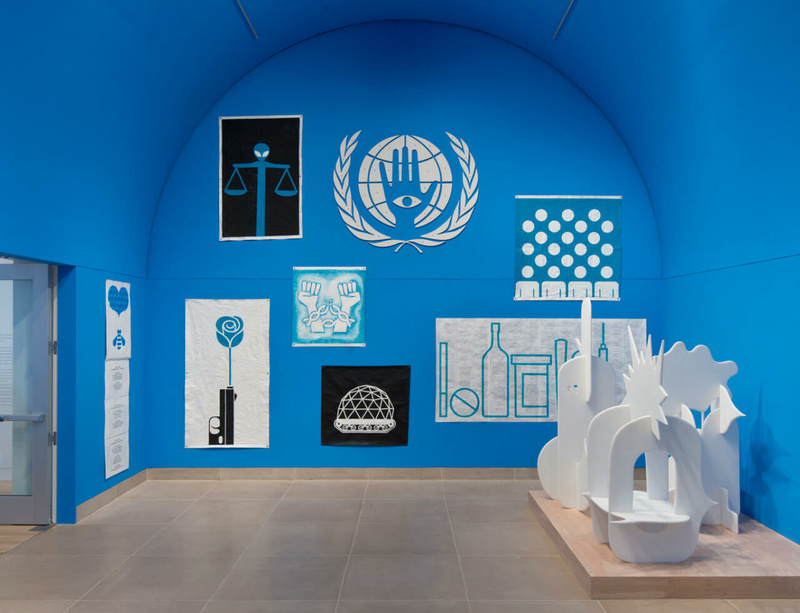 Both an exhibition and an event, Pedro Reyes’s Hammer Project The People’s United Nations (puN) puts the diplomatic and global problem-solving goals of the United Nations into the hands of ordinary people. The pUN General Assembly, to be held over 2-3 May, invites volunteer citizen-delegates from as many of the 195 member and observer states of the UN to engage in activities that will test the following hypothesis; that conflict-resolution techniques used in social psychology and the arts can help to solve the world’s most challenging problems, from climate change, to fair wages for women, to food shortages. Through various participatory techniques – involving theatre games, group therapy, and techniques from the social sciences – this group of regular citizens will grapple with a set of urgent and unexpected proposals and devise creative solutions. The exhibition also includes a selection of recent sculptures – including Drone Dove and Colloquium – as well as new paintings on Tyvek that graphically represent the political, social, and environmental issues being faced today.